Above: A cup of pale gold Dragon Buds Jasmine tea sits amid jasmine flowers that are the variety grown to scent the tea leaves. Photo courtesy of Mr. Yeh at Fang Ming Tea Factory, Fujian Province. Scented teas have been popular since the Qing Dynasty. The most well-known to the West is jasmine tea. 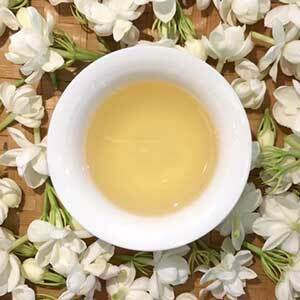 Scented with aromatic jasmine flowers, this tea is fragrant, refreshing, and an absolute delight. Not all jasmine teas are created equal. Top grade jasmine tea undergoes ten rounds of scenting, which requires multiple processing steps and one month of processing time. Commercial grade jasmine tea in tea bags or those served at restaurants are likely created by spraying jasmine extract on low grade tea leaves. 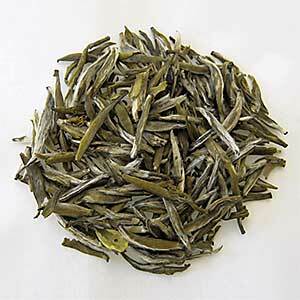 The best jasmine tea comes from Fuding of Fujian Province in China. The tender buds from this area are considered the best base material for jasmine tea because they are less astringent and more tippy, making them more conducive to scenting. During my trip to Fuding this spring, I was able to source a top grade jasmine tea that is made from the best leaves and processed according to the time-honed traditional method. The Dragon Buds Jasmine is only made once a year so supply is extremely limited. We are so proud to be able to offer this tea to our customers. Once sold out, it will be a year before it will be available again. Place 3 grams of tea in a 4-6 oz. gaiwan or teapot. Start steeping using 195 degree F water for 20 sec. for 3 infusions. Gradually increase steep time for subsequent steeping. After finish brewing, place the spent leaves in a water bottle and enjoy jasmine tea all day long. as well as for them. Heavenly. as is Miranda's Shangrila Gold Black that I am excited to to taste. Tea and snow on this winter day here in the Sierras. Thanks for your sharing your love of teas with all of us. Our responseThank you for your nice review and I am glad you enjoy the Shoumei. It is indeed and gentle and soft tea. Friends, family and I can't stop drinking this tea! The long, cooling finish is satisfying and I appreciate how many times I can continue to steep the leaves in my gaiwan before the flavor runs out. The flowerly taste of this jasmine is superior, leaving the impression that I'm standing next to the jasmine bush. It's a wonderful morning tea to drink without milk or throughout the day. Our responseThank you Ingrid for the nice review. I will let the maker of this tea know this jasmine has many loyal fans. This is legitimately the best jasmine tea I've ever had. Just the scent when you open the bag is magical. I've been able to use just a few buds in a thermos and by the time I get around to drinking it it's a really flavorful brew. I highly recommend this tea! Our responseThank you for the glowing review of the Jasmine tea. Every time I drink this tea, I think about the amount of work that went into making it. And that is what sets this jasmine tea apart from others.